Nine new exoplanets were announced today, a pretty amazing number considering that just a decade ago we were discovering just a bit more than that amount in total per year. The planets include some with some pretty weird retrograde orbits which makes it interesting from a planetary formation theory point of view, but none of these are Earth-like or close to it so in terms of Avatar-style capturing the imagination of the average person, not so much long-term interest in these discoveries. Adding nine to that total would make 37 so far this year, and extrapolating from that we get an approximate number of 111 for the year. That would look like this. Yeah! 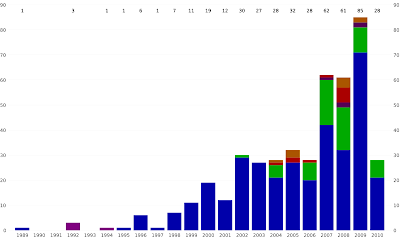 So 2010 is going to dwarf all other years in exoplanet discovery. Add to that the Kepler discoveries as they continue to pour in (Kepler was launched in 2009 and started its mission in May) and it very likely may be more than this. At least one Earth-like planet is what we're hoping for / expecting this year, of course. Everything else is just interesting in the astrophysical sense. By the way, ESO press releases are translated into a ton of other languages including Norwegian, Finnish and Turkish.